Two main islands and eight small islets house pristine beaches with luscious green rainforests coming right down to the sand and in certain places spectacular rocky cliffs. With hundreds of scenic hiking trails you can traverse the country side enjoying waterfalls, secret grottos and wildlife galore. A strong proud culture with many traditions such as their ‘ava ceremony and siva (dancing) live here, welcome to Samoa. Samoa is located in the Polynesian region of the Pacific Ocean it is halfway between New Zealand and Hawaii. The main islands are Upolu and Savai’i with Upolu home to 3/4 of the country’s population. All of the islands of Samoa have been produced by volcanoes, with Savai’i home to 3 active volcanoes (the last eruption was in the early 1900’s). 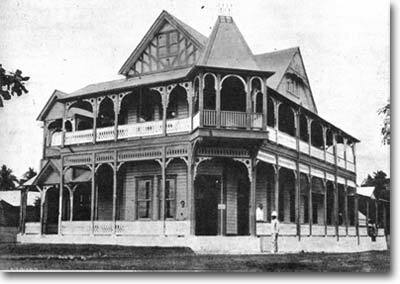 Samoa’s capital city and largest city is Apia which is situated on a natural harbour on the island of Upolu. The city’s clock tower which is also a war memorial is cited as the center of the city. Scattered there is still some early, wooden, colonial buildings most notably the old courthouse amongst other new infrastructure. Scottish writer Robert Louis Stevenson who wrote famous books such as Treasure Island, Kidnapped, and Strange Case of Dr Jekyll and Mr Hyde resided on the outskirts of town for his last four years of life and he was buried on top of the close mountain Mt. Vaea. The city’s harbour was also the location of a naval standoff in 1889. Seven ships from Germany, the US, and Britain refused to leave the harbor while a typhoon was approaching, all of the ships ended up sinking except one. Historic old courthouse originally built in 1906 in Historism and Art Deco style. Samoa’s cuisine very heavily based on fresh produce normally catch or collected that day. Produce such as taro, bananas, papaya, coconut (freshly made coconut cream or milk is an ingredient in an multitude of recipes), fish and other seafood are the basis of most dishes. Most Samoan kitchens are outside and use a umu (earth oven of hot stones) to cook all food. No oil is used in any of their cooking as they wrap their meat or seafood in banana leaves and cook it straight over the hot stones. 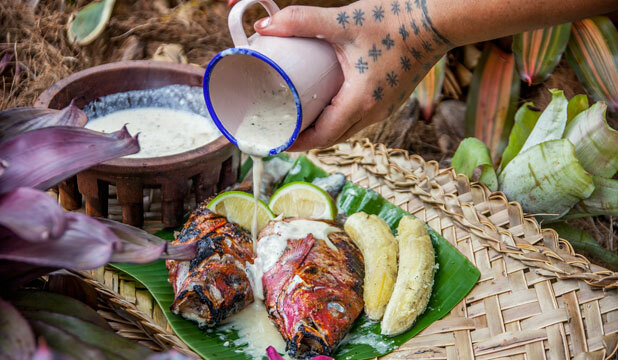 Some of the most loved dishes include palusami (young taro leaves baked in coconut cream) and oka, (raw fish in coconut cream). I decided to go sweet and chose Panipopo’s (sweet coconut buns) these buns are sold in bakeries all over Samoa. I sourced my recipe from → www.samoafood.com check it out for amazing Samoan recipes! Put yeast and water in a large bowl and cover, leave for 10 minutes, your yeast should be frothy at the end of the time. Add the rest of the dough ingredients and mix to form a soft dough, this can be done with a wooden spoon or any type of automatic mixer. Turn the dough onto a lightly floured surface and knead for 10 to 20 minutes or until the dough is smooth and elastic. Place the dough in a lightly greased bowl, cover and leave to double in size, about 1 hour depending on your kitchen’s temperature. Punch down the dough and turn out onto a lightly floured surface. 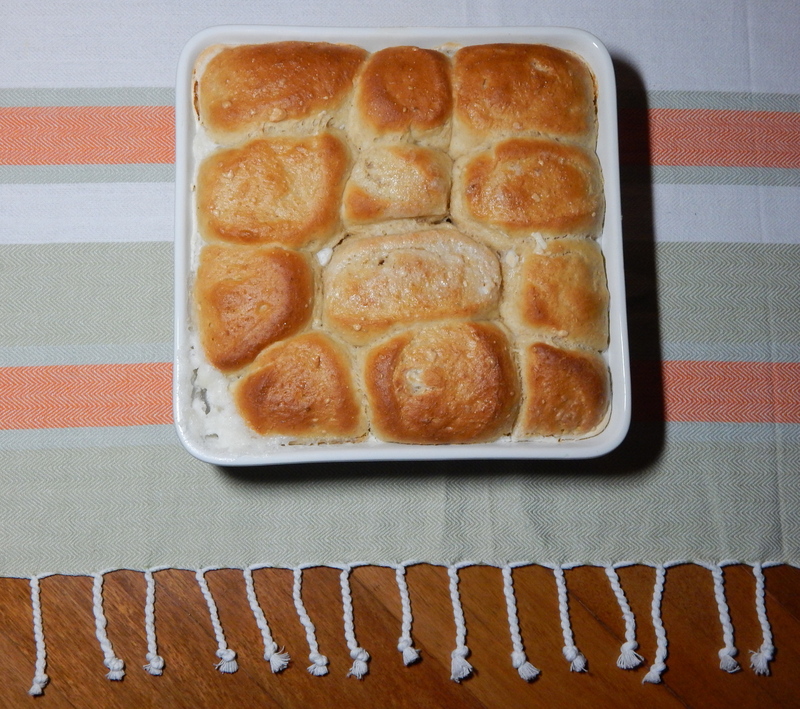 Shape into buns and place in an ungreased baking tin. Cover and leave to rise until almost doubled. While the buns are rising preheat oven to 190°C/ 375°F. Make your coconut sauce by combing all ingredients and mixing well. The buns were not the most amazing thing I’ve ever had but they sweet and gooey so they hit the spot. I think it was it bread that let them down a bit, the bread seemed a little to savoury for the sweet sauce, I’d suggest finding a sweet bread recipe that you know good and swapping that one for this one. They were nice with a large cup of black tea and a good book. Score 6/10.